As scrappers and crafters, we wait in anticipation for two huge weekends each year. The first of those weekends for 2015 is here and the waiting is over. Happy NSD to each and every one of you. I wanted to celebrate in full style with a bigger than usual bang so all of my Bundles have been reduced to SEVENTY PERCENT OFF for NSD. For less than the price of some of the kits you can get the entire bundle. What are you waiting for? Go Shop and Enjoy the new store at the Studio. 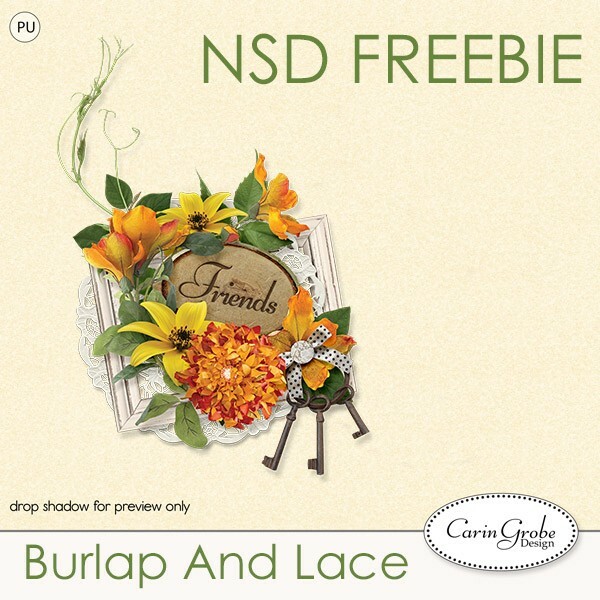 Be sure to grab this darling freebie first. It coordinates with my Burlap & Lace Collection (On Sale This Weekend For Only $2.85) but is versatile enough to make any page look impressive.